Located in a beautiful Georgian building in Cavendish Row Cassidys Hotel is perfect for a stay in Dublin. Cavendish Row is a historic area called after Cavendish the third Duke of Devonshire. At the top of O Connell Street it is perfect for the guest to explore all that Dublin has to offer. The hotel itself has been restored to offer all the comforts of a modern hotel while retaining its Georgian elegance. The 88 elegant en suite rooms in Cassidys Hotel are very comfortable and fitted with all the necessary facilities for the up-to-the-minute guest. The décor is bright and modern and facilities include TV, direct dial telephones, trouser presses, tea and coffee making facilities, hairdryers and personal safety deposit boxes. Cassidy’s do everything possible to ensure a pleasant stay for all guests. Groomes Bar is perfect for a drink and a natter with friends to relax after a hard day. Groomes also serve an excellent traditional pub lunch. Cassidys is home to Restaurant 6 which offers contemporary Irish cuisine cooked from all fresh ingredients and served in stylish surroundings. They offer excellent value pre theater meals and early bird menu from 5.30pm to 7.15pm. Cassidys is located at 7 - 8 Cavendish Row, upper O'Connell Street, opposite the famed Gate Theatre. Close to Henry Street and Grafton Street where top class shopping can be enjoyed. 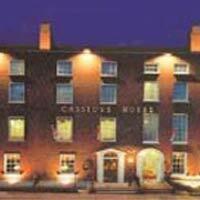 Cassidys is also close to St Stephens Green and the lively Temple Bar area with it array of restaurants, cafes and night clubs.